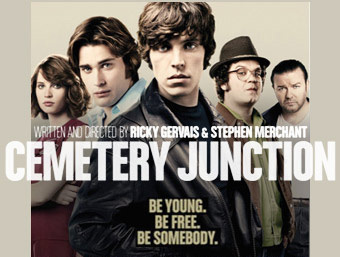 Cemetery Junction is Ricky's first movie collaboration with long-standing writing and directing partner Stephen Merchant. The pair previously wrote and directed the hit TV comedies The Office and Extras. The film is set the seventies in a provincial English town and Freddie (Christian Cooke) is young and keen to break free of his working class roots. But what will his best mates Bruce (Tom Hughes) and Snork (Jack Doolan) make of his aspirations? Ricky has described Cemetery Junction as a "love letter to England" and promises a celebration of youthful exuberance - England's 'Saturday Night Fever'. A release date of April 14th 2010 in the UK has been announced. The first teaser trailer has been released. Ricky and Stephen introduce a revered cast member. Ricky's next movie, and his first film collaborating with Stephen Merchant, has begun filming in London. Ricky stars alongside Ralph Fiennes and Emily Watson. Read more about Cemetery Junction in the press release.